Original Portrait from Dictionary of American Portraits, edited by Haywood and Blanche Girker & the staff of Dover Publications, Inc., New York, 1967. James Logan was a public servant and political leader in colonial Pennsylvania. He was born in Ireland in 1674. Logan was descended from Scottish royalty, and his parents made certain that their son was well educated. 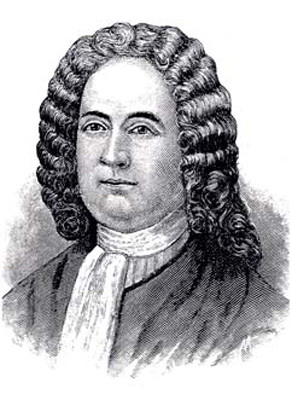 In 1699, James Logan traveled to America with William Penn as his secretary. He settled with Penn in Philadelphia and spent several years managing the business affairs of the Penn family. While in Philadelphia, he also served on the provincial council. He represented the interests of the council when he visited the Ohio Country in 1705. Logan was Pennsylvania's chief negotiator during this period with American Indians. He quickly earned the trust of the Ohio's American Indian leaders. A Cayuga chief so admired Logan that he named his own son Logan. After returning to Philadelphia, James Logan was charged with abuse of his office with the provincial council, and he returned to England. While in England, Logan successfully defended his reputation and then came back to America. He became a judge in the common pleas court. Eventually, he served as mayor of Philadelphia. Logan remained active in Philadelphia and helped found the University of Pennsylvania and a library. He remained in Philadelphia until his death in October 1751.